Utter Pradesh: The heartland of India is known for its Heritage, Culture and bounties of Nature. It is home to some of the greatest monuments, the most ancient city in the world and the seat of Buddhism and the colours of all faiths. Rajasthan: Folklore of heroism and romance resound from the formidable monuments that majestically stand to tell the tale of a bygone era. The magic of vibrant Rajasthan, its rich heritage, colourful culture, exciting desert safaris, shining sand-dunes, amazing variety lush forests and varied wildlife make it a great tourist attraction. Delhi: Locally pronounced as "Dilli". The state is divided into 2 cities Old Delhi & New Delhi, New Delhi being the capital of the Country. Located on the banks of river Yamuna and is the site of magnificent and medieval monuments, archaeological sites and remains. Call us at: 1-800-842-6943, mytravel@platinumholidays.com. Arrival in Delhi the "Capital of India". Upon arrival our representative will meet and assist you to your hotel. Rest of the day at leisure. Overnight at your hotel in Delhi. 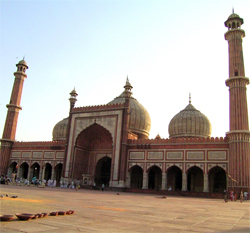 Jamma Masque: Jama Masjid is the largest mosque in India and stands across the road from the Red Fort, built in 1656 by Shahjahan. About 20,000 people can pray here at a time. Chandani Chowk: Originaly called Shahjaanabad, a very well known market which was once visited by merchants from around the world. It is one of the major shopping hubs of Delhi. A visit to Delhi would be incompleat without a trip to Chandni Chowk. 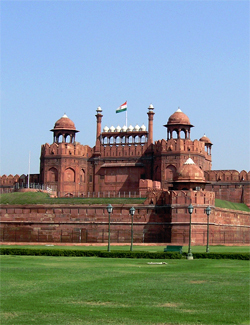 Red Fort: One of the most spectacular pieces of Mughal Architecture. Built by Shah Jahan in the 17th century. The walls extend up to 2 kms in length. It is now a busy market place called the "Meena Bazzar". The Bazzar has an excellent collection of antiques, miniature paintings & beautifully crafted Ivory Jewellery. Raj Ghat: This is the place where the Father of the Nation "Mahatma Gandhi" was cremated. Raj Ghat is a simple square platform with a black memorial stone with "Hey Ram" inscribed on it as those were the last words said by him after he got shot at. Qutab Minar: One of the most all & attractive monuments in Delhi. It can be seen from most of the parts of the city. It is among the tallest towers in the world. It was built and completed before 1200 AD. It is a masterpiece of the Mughal architecture with beautiful carvings. Connaught Place: one of the largest financial, commercial & business centres in Delhi. Its surroundings occupy a place if pride amongst the heritage structure of the city. Officially known as the Rajiv Chowk named after the former prime minister of India "Rajiv Gandhi". Humayun Tomb: one of the most remarkable structures by the Mughal Empire in India. 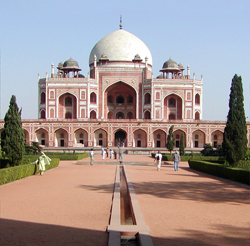 Visiting the Humayun Tomb is a wonderful experience where you learn about the history of the Mughal rule over India. Overnight at your hotel in Delhi. After breakfast you will depart for Jaipur. The flight is about one hour. On arrival our representative will meet and assist you to your hotel. Rest of the day is at leisure. 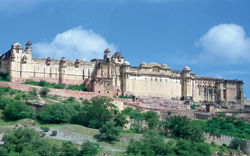 Jaipur: Jaipur is the first planned city of India, located in the desert lands of Rajasthan. is the major business centre for the natives of Rajasthan with all requisites of a metropolitan city. 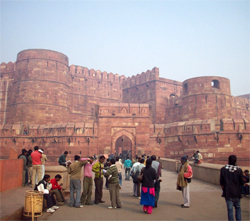 Also known as the Pink City for its major architecture being in red sandstone. Overnight at your hotel in Jaipur. Amber Fort: Located in the Aravali hills (range of mountains in western India and eastern Pakistan, running approximately 800 km from northeast to southwest) The Amber Fort is built in 1592 with white marble & red sandstone. With its crystal mirror image on the still water of the lake makes a beautiful illusion. The outer appearance of the fort is rough & craggy but the intricate carvings, mirror work inside on the walls & ceiling simply astonish the visitors by its grand appearance. Overnight at your hotel in Jaipur. Hawa Mahal: a major landmark and a famous tourist attraction, built in 1799. 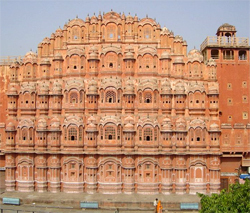 The splendid Rajputana architecture of Hawa Mahal speaks of the glory of the Royal Family. Hawa Mahal means "Palace Of Wind". Was built to enable the ladies of the royal household to watch street processions while remaining in a strict state of Purdha. It is shaped like a pyramid with 5 stories & 953 small windows decorated with Lattice work. These windows are made of pink sandstone and are commonly known as "Jharokhas". Jantar Mantar: derived from the Sanskrit word "Yantra Mantra" meaning instruments & formulas. The Jantar Mantar is a collection of an architectural astronomical instrument which used to observe the position of the sun & celestial bodies in the ancient times. 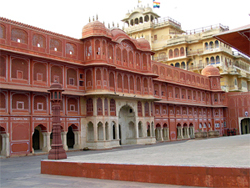 City Palace: one of the most famous & a major Landmark to the city of Jaipur. Its outstanding art & architecture, series of gardens, courtyards & building with a touch of Rajasthani & Mughal architecture make it a great tourist attraction. Overnight at your hotel in Jaipur. Today after breakfast you will depart for Ranthambore. The drive is approximately 6 hours. On arrival our representative will meet and assist you to your hotel. Places you will visit today are: Mansarovar Lake: this lake is a place of pilgrimage, attracting religious people from India, Nepal, & Tibit. As per hindu theology, lake Mansarovar is a personification of Purity and who drinks water from this lake will go to the abode of Lord Shiva after death. The one who drinks this water is believed to be cleansed all his sins committed over even a hundred life times. Also well known for its picturesque sunsets. Overnight at your hotel in Ranthambore. Today start your day with a early breakfast and leave for game drive to the Ranthambore National park located in the Aravali hills. 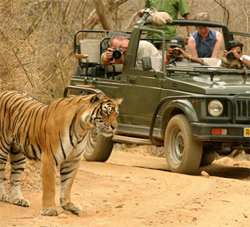 Ranthambore National Park: one of the biggest and most renowned national park in north India. 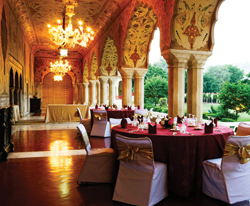 It was once the hunting preserve of the Maharajas of Jaipur. The tigers are a great attraction here and along with them you will also enjoy several varieties of birds, leopards, caracal, hyena, jackal, crocodiles, bears and different types of deer's. Evening will be at leisure. Overnight at your hotel in Ranthambore. After an early breakfast take a transfer to Bharatpur by train. The journey is about one and a half hour. 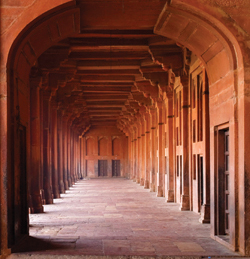 On arrival you will be assisted by our representative for a tour to Fatehpur Sikri. Fathepur Sikri: The mysterious ghost city founded by the Mughal Emperor in the late 16th century. It was the first planned city and the capital of the Mughal Empire. Built with Red Sandstone and composed of pillars, ornamental arches, bracket, chajjas & Jharokhas making it versatile to the Indo � Muslim style. After a visit to Fathepur Sikri you will take a transfer to Agra by road. This journey will take you about one hour. On arrival our representative will meet and assist you to your hotel. Later proceed for a sunset visit to the Taj mahal. Taj Mahal: It is the epitome of Mughal art and one of the most beautiful building in the world. It is one of the seven wonders of the world. Made by emperor Shahjehan in the memory of his beloved wife Mumtaz. Made of marble and stands as the symbol of love. Overnight at your hotel in Agra. 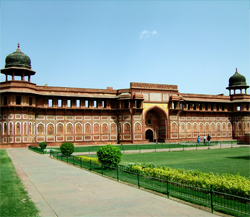 Agra Fort: located near the gardens of Taj Mahal and Yamuna River. Built in the 16th century by the Mughal Empire, made out of Red Sandstone. It was an imperial city with palaces like Khan Mahal, Shesh Mahal & an audience hall called the Diwane khas & 2 very beautiful Masques. Yamuna River: one of the country's most sacred river. Also known as Jamuna. Located in the north of India the Yamuna at the end goes and joins the River Ganga. Their confluence is an especially sacred place for the Hindus. 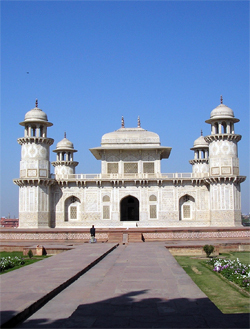 Itmad-UD-Daulah: Itmad-Ud-Daulah is a beautiful Mughal Tomb and is known by many as the 'Baby Taj Mahal', due to its similar appearance. Built during the early part of the 17th century and situated on the banks of the Yamuna River, the Itmad-U-Daulah was the first ever Mughal structure to be completely built with marble and is the tomb of Mizra Ghiyas Beg. The peaceful gardens boast a series of walkways and inter-connecting watercourses. Evening at Leisure. Overnight at your hotel in Agra. After an early breakfast leave for Jhansi by train. The journey is about 4 hours. On arrival at Jhansi you will drive to Orchha. Orchha: Captured in stone, a medieval city where time has frozen and rested lightly. 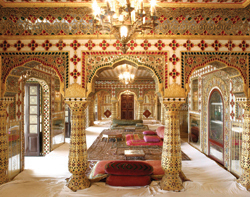 Palaces and temples built by the Bundela rulers in the 16th and 17th century retain their pristine Perfection. Jahangir Mahal: The most admired place in Orchha, constructed to commemorate the visit of Emperor Jahangir to Orchha. A three storied building, which is a harmonious blend of Indo-Islamic architecture, with hanging balconies, topped domes, marvellous sculptures, delicate chartist and trellis, Jahangir Palace presents a superb architectural grandeur. Raja Mahal: Every year, thousands of visitors from various parts of the world pay a visit to this majestic palace. Built in the 17th century, crowned by chhatris, elevated balconies marked by towers & domed Pavilions. The interiors are beautifully done with fragmented mirrors & painting on both ceiling & walls. After Lunch drive to Khajuraho. Evening at leisure. Overnight at your hotel in Khajuraho. After breakfast this morning take a sightseeing tour of temples. In the afternoon take a flight for Varanasi. The journey is about one hour. On arrival our representative will meet and assist you to your hotel. 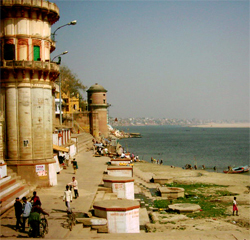 Varanasi: the world's most ancient city and the home of Hinduism. The present name is derived from the fact that it is at the confluence of the two rivers "Varuna" and "Asi" that flow across the city. In the evening drive to the Ghat to see the priest perform the Aarti along with the "light cceremony" on the banks of River Ganga. 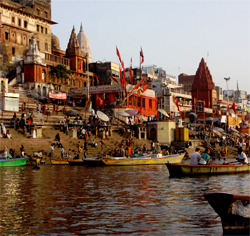 Ganga: The Ganges is the most sacred river to Hindus and is also a lifeline to millions of Indians who live along its course and depend on it for their daily needs. It is worshiped as the goddess Ganga in Hinduism. It has also been important historically: many former provincial or imperial capitals (such as Patliputra, Kannauj, Kara, Allahabad, Murshidabad, Baharampur and Kolkata) have been located on its banks. Overnight at your hotel in Varanasi. Sarnath: About 10 km from the holy city of Varanasi, is the place where Buddha chose to deliver his first sermon. There are many Buddhist monuments and edifices in Sarnath. Some of the important Buddhist monuments at Sarnath are the Dhamekha stupa, the Chaukhandi stupa and monasteries and temples of different schools of Buddhism from Japan, China, Thailand, Burma and others. 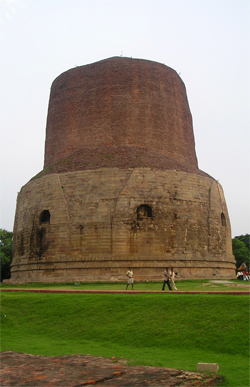 It makes Sarnath one of the most venerated Buddhist places. Besides Buddhism, Sarnath is also connected with Jainism. Banaras Hindu University: Largest and oldest university of North India. It accommodates upto 12000 to 15000 students living on campus each year. The campus is spread over 1350 acres of land. It has over 140 teaching departments and over 55 hostels for both girls and boys. Bharat Mata Temple: Dedicated to Mother India, built by Mahatma Gandhi. It was inaugurated in 1936 so that the citizens could respect Mother India in statue form which was built in marble. The statue is a replica of undivided India in three dimensional which has the mountains, plains and oceans in right proportion. Overnight at your hotel in Varanasi. After breakfast your morning will be at leisure. In the afternoon take a flight to Delhi. On arrival you will be transferred to your hotel. Evening at Leisure. Overngith at your hotel in Delhi. End of tour. Our representative will assist you with your arrangements for your journey back home.